The “first-connection impression” is that important moment when a subscriber first connects into the network and instantly judges its safety, reliability, and speed. Suspicious application activity, an inaccessible favorite web site, or slow response results in calls into customer care or subscribers questioning loyalty to their current service provider. Infoblox solutions for Service Providers enable the crucial IP connection between the subscriber and his digital world. Our Next Level Networking capabilities provide carrier-grade security, high availability, and ultra-low latency that helps create a better first-connection impression for subscribers. In turn, they enable service providers to enhance cost efficiencies, visibility, insight, and manageability, while supporting a smooth transition to NFV. Virtual and private clouds provide your organization with undeniable benefits in scalability, agility, and cost control for your distributed network needs. However, conventional network management tools undermine those advantages. For example, configuring DNS and IP addresses are largely performed manually using segmented point solutions. These tools are not designed to support elastic scalability. Nor can they provide the control, visibility, reliability, and consistency your organization demands. That’s why we created Infoblox DDI for Virtualization and Private Cloud. The solution enables you to control DNS, DHCP, and IPAM for complex distributed virtual and cloud-based environments centrally, flexibly, and efficiently. Now you can support complex multi-platform workloads with confidence and maximize the full potential of your private cloud and virtualization deployment strategy. Secure DNS maintains service availability during malicious attacks. Protect your subscribers and network infrastructure from growing threats. Service providers have embraced network functions virtualization (NFV) and software-defined networking (SDN) as key technologies to promote service agility for fast roll-out, simplify network operations, provide cost-effective and elastic scalability, and reduce costs. The Infoblox Virtual Secure DNS solution for service providers is a hardened, proven solution that provides mission-critical functionality while reducing business and operational risk during the network transition to NFV and SDN. Secure DNS caching, including DNS Firewall and Advanced DNS Protection for Service Providers, protects subscribers through use of global threat intelligence and automated protection packages. The high-performance solution maintains critical DNS service availability in rapidly evolving networks and even during malicious attacks. Sub-millisecond response and advanced threat protection maintains a low latency and a secure subscriber experience. 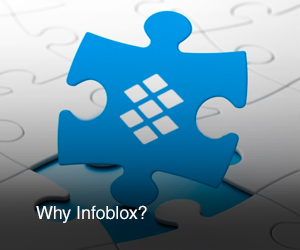 Patented Infoblox Grid™ technology provides highly efficient management and control. The automated network control solution frees key technical and network operations staff from labor-intensive, costly, and error-prone administrative tasks, automates routine tasks such as updates, patches, and configuration changes, and provides a single centralized view of the entire network, with advanced reporting visibility for planners and operations teams. Infoblox Authoritative DNS with automated Grid and DNS Traffic Control reduces administrative burden for maintaining accurate records, supports effective traffic distribution, improves network visibility, and helps service providers meet subscriber expectations for high speed and responsiveness. When combined with dynamic traffic control (DTC), the solution mitigates over-provisioning of network nodes or directing of traffic to unavailable nodes and maintains consistent availability. IP Address Management ensures IP address accuracy record address management and enables fast provisioning in traditional and virtual environments. The solution provides up-to-date, comprehensive, tunable network discovery and selection and provides network teams with visibility into network activity. Ready to learn more? We are happy to help you.